In stark contrast, the Estuary Project will utilize bulldozers on the Goat Rock State Park Dunes as many as 36 days a summer between May 15th and October 15th, in order to construct an outlet channel that allows river water to flow out, but forms a barrier to keep salty ocean water from coming in. The goal is to develop a fresh water lagoon that provides fresh water habitat for Steelhead and Coho juvenile fish to grow fatter before their lengthy sojourn in the ocean. There are many problems with altering this natural phenonomen for two species, including increased water quality degradation, possible loss of seals who leave area when mouth is closed, limited beach access during channel construction and maintenance, permanently lowered summer river flows, etc. The worst part is that this is an experiment, and no one knows if it will work as intended. We have a great deal of news to share with you this month and will jump right in to inform you about our current activities. Water Agency Directors approve Estuary Project….. The Sonoma County Water Agency (SCWA) Board of Directors (County Supervisors) approved the Estuary Project on August 16, 2011. They allowed only 18 days for citizens to study the lengthy Final Environmental Impact Report (FEIR) before certification. On August 15, 2011, RRWPC submitted a 21-page letter expressing our concerns. Supervisors also received about ten other letters on the day before the meeting. SCWA provided no formal response to comments, as they were not legally required to do so. RRWPC water and wastewater issues are rather quiet for now. Within a few months, all that will change. In the meantime, we are developing a new and more comprehensive website for our organization. With no critical meetings or comment periods coming up soon, we offer our review of important issues we’ve been tracking. Well, another year has flown by and RRWPC is about to begin its 32nd year as a nonprofit corporation. There’s a saying, “Time flies when you are having fun!” While “fun” may not be the appropriate word to describe what we do, we have certainly been absorbed and determined and concentrated on the goal of limiting some of the damage that has been continually visited on the Russian River over the years. We are grateful for your loyalty that has kept us going over time, and hope our precious relationship will continue for many years to come. 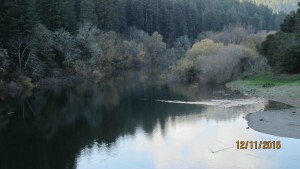 Sonoma County Water Agency (SCWA) received 173 comment letters last month on the Russian River Estuary Project Draft Environmental Impact Report (DEIR), most expressing concerns about the project. They included letters from Monte Rio and Russian River Recreation and Parks Districts, the national environmental group Defenders of Wildlife and the Sonoma County Water Coalition, along with individual letters from many of the Coalition’s 30 member organizations. Numerous other businesses, organizations, and concerned individuals wrote also. Thanks to you all! While the cost of living reaches skyward as incomes and work opportunities go downhill, increased utility costs that offer no opportunity to limit service, are becoming more and more of a burden to average citizens. Those of us in County Sanitation Districts have no control over the size of our bills. For the convenience of the County, everyone pays the same flat fee, no matter the size of their households, the amount of water used, or wastewater generated. What follows is a case in point.